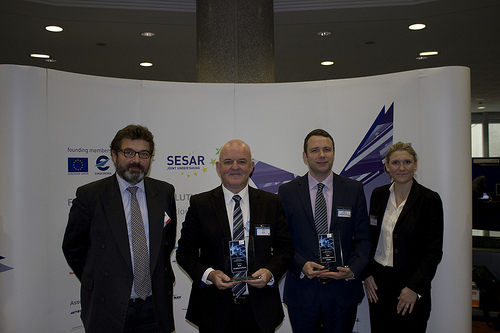 Out of 100 participants and 21 data providers from around the world NATS, Snowflake Software, and Harris Corporation have all earned ‘Best-In-Class’ awards in the EUROCONTROL sponsored SESAR SWIM Master Class 2013 for their joint entries. The NATS and Snowflake team achieved first place as overall Best-In-Class winners in the ATM Information Services Category for their “Arrival Sequence Service”, while the NATS, Snowflake and Harris entry, “Trans-Atlantic Weather Information Management” scooped second prize. The NATS led project saw them partnering with Snowflake – the 2012 SWIM Master Class winners – to prototype a tool used to reduce stack holding at London Heathrow. In 2009, delays caused by holding at Heathrow alone are estimated to have cost in the vicinity of £60m, with those aircraft held for an average of 7.6 minutes. NATS and Snowflake demonstrated savings of £33.5m in fuel, 32,000 tonnes of C02 and an increase in safety by providing Heathrow Arrival Sequence and temporal information to adjacent control centres in Maastricht, Reims, Brest, Shannon, Dublin & Prestwick. Operational decisions could be made earlier, slowing aircraft en-route and therefore limiting the amount of time spent holding on arrival. NATS’ Tony Vaudrey and Kevin Loy with Alex Brooker, Snowflake Software and Lisa Sullivan of Harris, collecting their awards. Alexis Brooker, Principal Consultant at Snowflake, commented: “The SWIM Master Class has provided us with an opportunity to innovate with operational SWIM web services and demonstrate that, through the implementation of SWIM, the industry can make substantial economic and environmental savings in the short term. The NATS, Snowflake and Harris team, supported by Netsys, were able to demonstrate the benefits gained from sharing weather information across international boundaries. The team utilised both European SESAR and FAA NextGen SWIM standards to provide end users with standardised access to a single source of weather information. “The ability to easily exchange aeronautical information across international borders is fundamental to standardised aeronautical information management. To be able to demonstrate that SWIM is working on a trans-Atlantic scale, that the SESAR and NextGen programmes are harmonised through the use of data exchange standards, is exciting to be a part of.” commented Alexis Brooker, Principal Consultant at Snowflake. The SESAR SWIM Master Class has the objective to develop and demonstrate state-of-the-art ATM technology, while bringing together development teams from across Europe in both industry and academia. “To be recognised once again as Best-In-Class is a great achievement and something we’re incredibly proud of.” said Alex Brooker, Snowflake. NATS will now use this recognition as a basis to further develop web services through its SPACE research and development facilities, as a proof of concept platform prior to operational implementation of new concepts. This year’s SWIM Master Class took place from June to November 2013 with best-in-class winners announced at the EUROCONTROL offices in Brussels.